- Lovely Celtic knot in emerald glass. Approx. 4" in diameter. Comes with a hemp cord and glass beads for hanging. 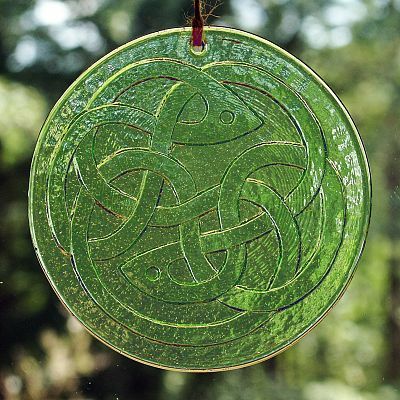 Do you have any other questions about our Celtic Knot Suncatcher? Needed a little something to keep my mood up when the sun is shining through the kitchen window. This Sun Catcher did the trick. Provides a nice point of interest and lets visitors know of my Celtic heritage. Fast service and delivery. Very happy experience.